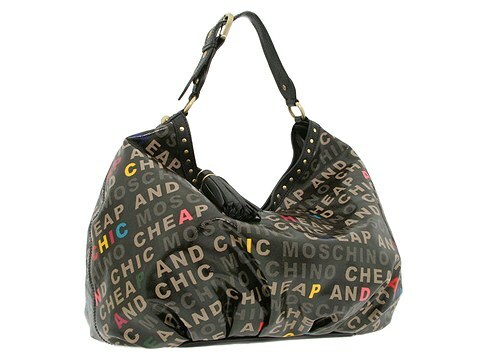 No one does a signature print like Moschino! ; Hobo style shoulder bag made of laminated canvas. Holds your wallet, sunglasses, personal technology and a copy of your favorite magazine. Dimensions: 17 wide across center x 9 1/2 deep x 10 1/4 high. ; Adjustable single shoulder strap. Shoulder drop: 10 length. Top zip closure. Contrasting satin lining with a back wall zip pocket and multifunctional slip pockets. Made in Italy.